The Boomsday Project brought a breath of fresh air to the Ranked Standard meta, but how has it affected Arena? Let's find out. 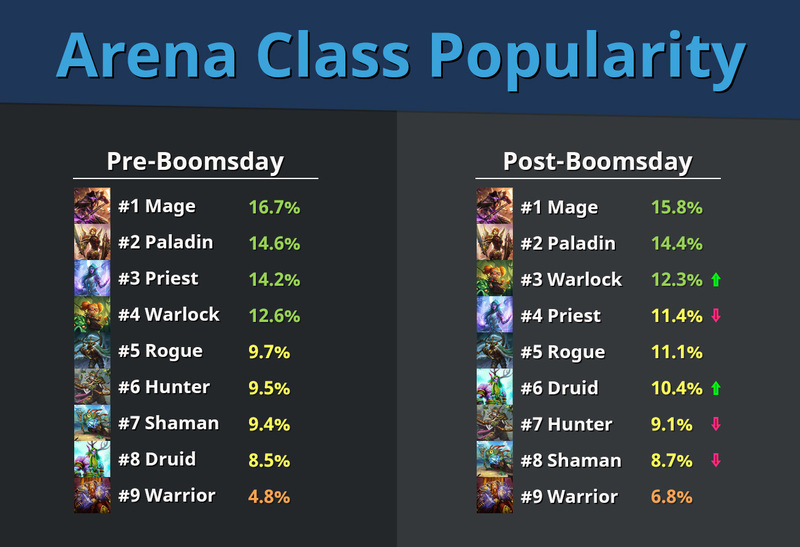 Before the release of The Boomsday Project on August 7th, Arena players were heavily favoring four classes for their picks: Mage, Paladin, Priest, and Warlock. Combined, these classes accounted for nearly 60% of all class picks while Warrior, the least picked class, had a measly 4.8% popularity. Once the expansion hit, Druids and Warriors posted the biggest gains with a ~2% increase in popularity - which still wasn't enough for them to break out of the bottom half of the ranks. Mage managed to remain at the top followed by Paladin, but all of the most picked classes saw a decrease in popularity, making the rank less top-heavy and more evenly distributed. Despite still being featured in the top four, the Priest class experienced the largest drop with -2.8% and lost the third spot to Warlock. This may seem like a small drop, but Arena as a whole is seeing a 42.3% increase in the number of games played since The Boomsday Project while Priest only saw a 7.1% increase in play. 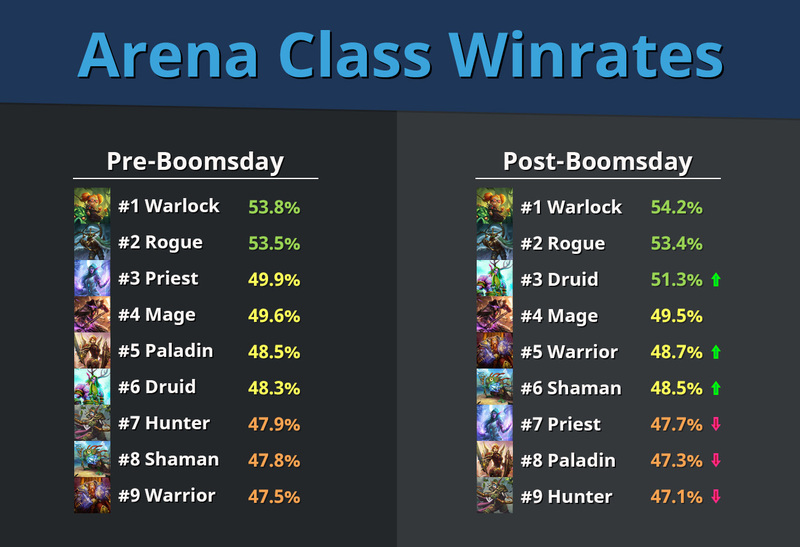 Despite Mage and Paladin being the most picked classes, it was really Warlocks and Rogues who dominated the Arena meta the week before Boomsday. With winrates north of 53%, the classes were just above and beyond the competition and the new expansion did little to change that. Warlocks and Rogues' winrates remained virtually untouched by the new expansion, with new cards like Omega Agent, Crazed Chemist and Brightnozzle Crawler boasting strong played winrates to help them stay on top. Paladins and Priests on the other hand were the biggest losers with a -1.2% and -2.2% drop in winrate (the most of all classes), respectively. The new Paladin cards in particular are not helping the class, with only one >50% winrate card in Glowstone Technician. On the other end of the spectrum, the Warrior class managed to move from the bottom of the ranks to #5 with a +1.2% increase in winrate, pushed by strong played winrates from Beryllium Nullifier and Supercollider. But it is Druid who seems to have benefited the most with the new expansion, with a whopping +3% increase in winrate thanks to outperformers Gloop Sprayer and Tending Tauren's impressive played winrates of 66.5% and 57.5%, respectively. Have you noticed a change in the power level of the classes in Arena? What class did you start picking that you didn't before? Let us know your thoughts on Twitter or Facebook! Director of Business Operations at HearthSim. Favorite classes are Rogue, Warrior and Druid.